I have always wanted a set of beautiful plate chargers, especially for the holidays. And, being a thrifty mama I have had a really hard time justifying the price tag to amass enough of these to create a full place setting around our farmhouse table. I have thought of picking them up at Dollar Tree, and painting them, but I just had not found a paint that looked close enough yet to the look I was going for. Galvanized steel is kind of my jam right now. We found a huge vintage galvanized handled tub on a local Facebook buying/selling site for lovers of shabby vintage goodness. I will share it when I am done with the living room for Christmas. 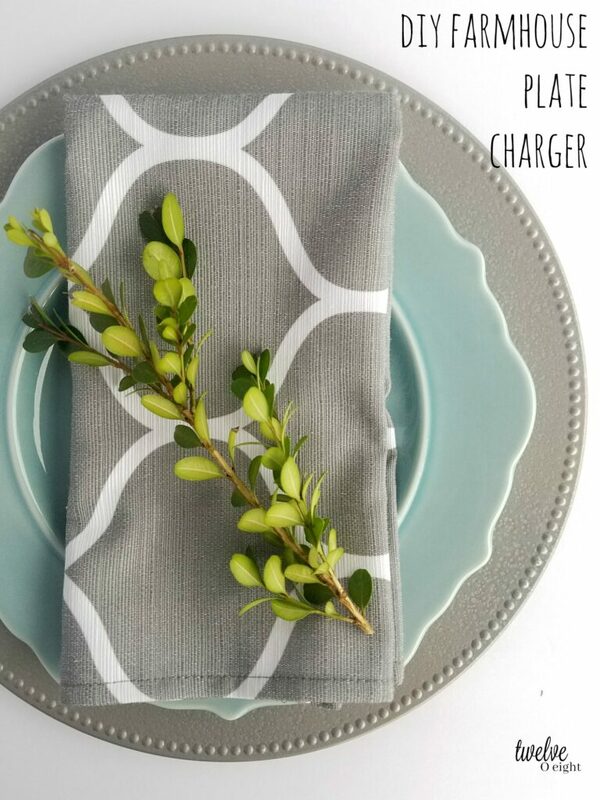 And once that galvanized goodness came into the house and waited for the tree to come home from the woods recently, I knew I needed to find a paint that looked as close as possible for my plate chargers. Well, I am happy to report that I found it, I love it. And I am going to try hard not to paint 1,000 things in our home with this glorious magic in a can. 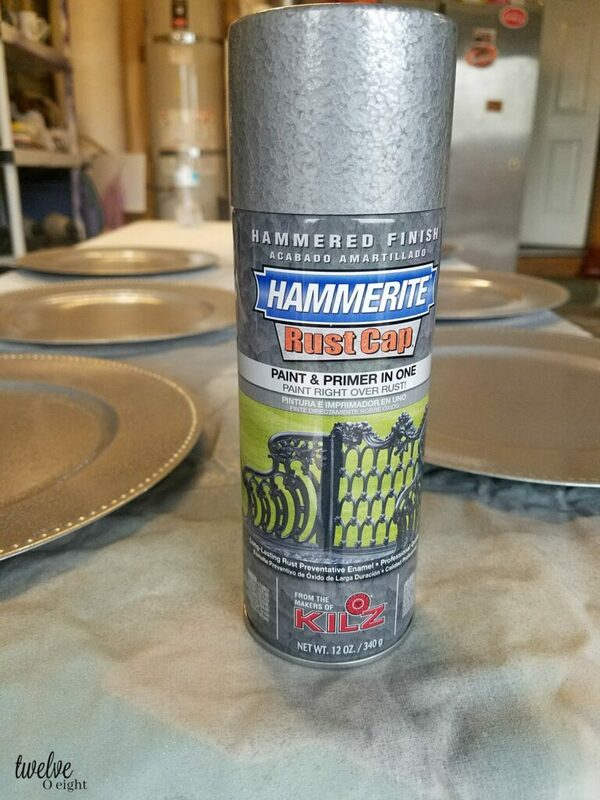 Meet my new bestie, Hammerite Rust Cap by Kilz. I don’t see the spray paint listed on the website but I was able to find it at my local hardware store. This is Hammered Silver Gray. If you have ever tried to paint something to look like metal you know how hard it it so not end up with something sparkly and way too shiny. I wanted a dark, rustic look that was light enough to still look like galvanized metal, without the tiny pieces of flake in the paint. Needless to say, I cannot wait to use these for Christmas, and the best part? 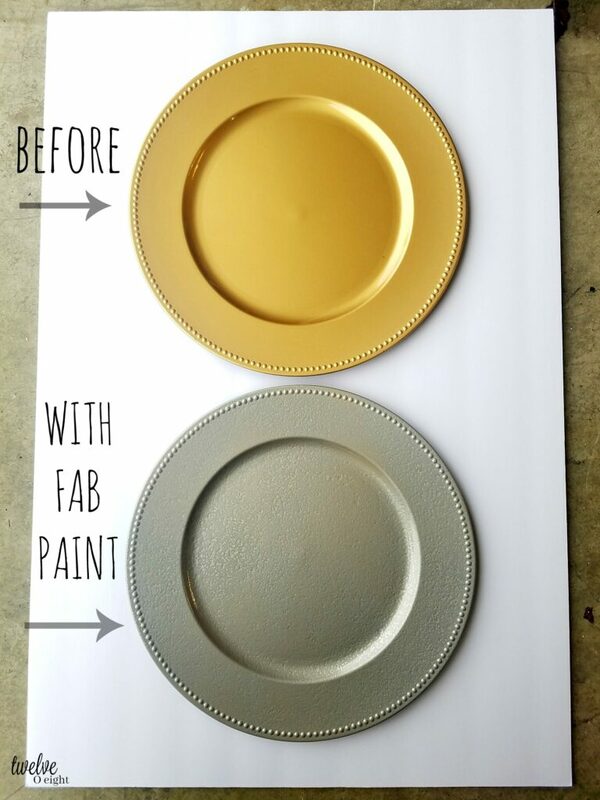 The paint was less than $10 per can, and I used a half of a can to do 8 plastic plate chargers from Dollar Tree. Yep, I will be going back to get four more so I can have a full set of twelve for our table. Not too shabby for less than 25 dollars right? This gave a nice, clean surface and the paint adhered very well. We did a total of three coats and each dried pretty quickly even though we painted them on a rainy Pacific Northwest afternoon with the garage door up. A thin coat each time seems to be the secret to avoid drips and get the best coverage with most spray paints. That was the case with this as well, and I just love how they turned out. 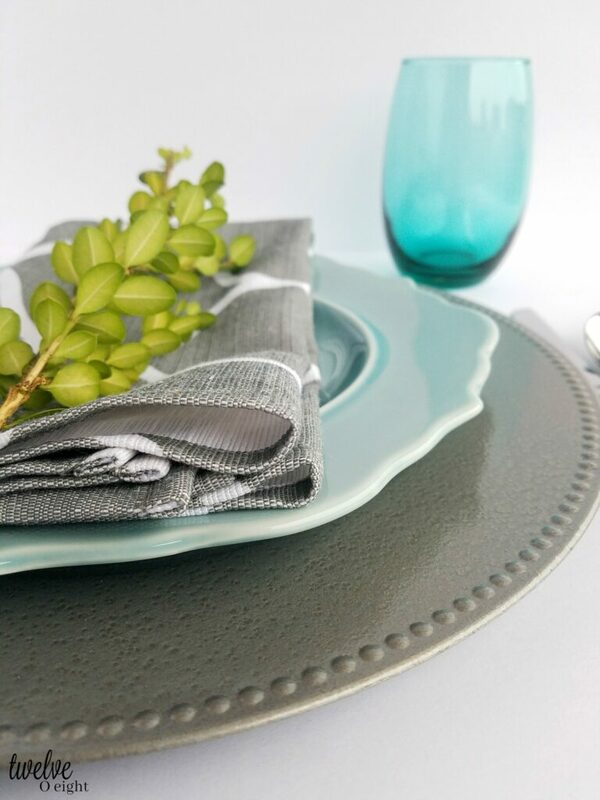 Here is how I think I may style them for our Farmhouse Christmas Dining Table, with these aqua dishes I found at Target, a cloth napkin, and greens clipped from the yard. What is your favorite Dollar store/tree/general find that you have given a makeover? I would love to hear how you have taken a thrifty find and made it fabulous! with that blue (which is my fav color)…..it really looks lovely. Thank you Nellie! That blue has become one of my favorites too, is serene and seems to go with everything! Your creativity always inspires me!! There are a lot of things I wish they had and sometimes it’s hit and miss, I wonder if you could find something like that online? But sometimes you just want to walk thru a store for inspiration too. Thank you friend, appreciate you! It’s amazing what pint can do! Your plate chargers look lovely. You have so much more to choose from than we do in Australia! Maybe they can be found online? That is frustrating when you don’t have the selection you need for a project, thank you Linda for visiting!!! So very pretty and I can’t wait to do this to my chargers. Thanks for sharing with us at the Waste Not Wednesday link party. Can’t wait to see what you are up to this week. These turned out so beautiful Tanya!!! 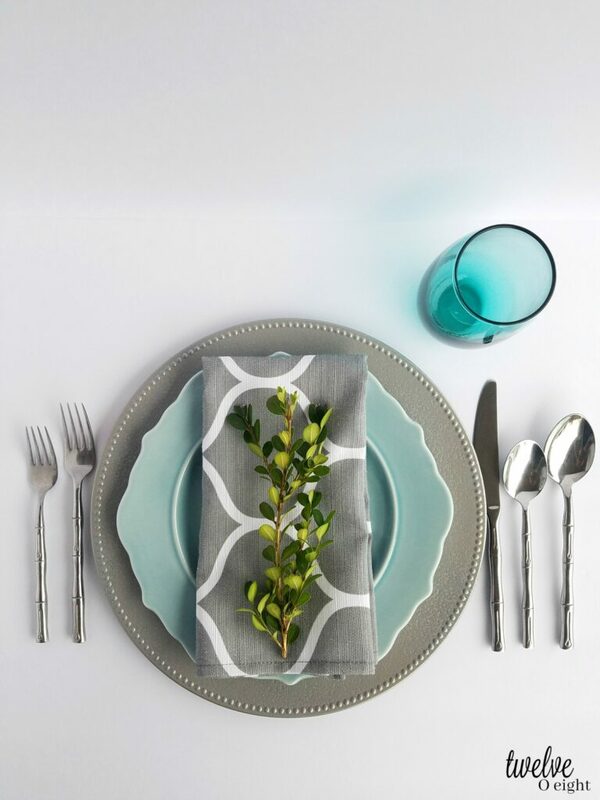 Love your table setting too! You are one clever creative lovely!! SPrTlB Yes. It should work. If it doesn at send us an email.